15 Years of GreatCustomer Service! I WANT... a trainer kite that is SIMPLE & EASY to fly. I WANT... a trainer kite that is SIMPLE & EASY to fly. I WANT... a trainer kite for a BIG GUY. I WANT... a trainer kite with POWER! I WANT... a FAMILY-FRIENDLY trainer kite. I WANT... a trainer kite I can use in the WATER. I WANT... a LESS EXPENSIVE trainer kite. I WANT... a trainer kite/beginner kite that can also be used for SNOW KITING. I WANT... a 4-line trainer kite that RIGS LIKE A FULL-SIZE kite. Trainer kites are most likely going to be to small for the average Adult. The larger sizes like the HQ Rush 350 Hydra 350 may work for lighter riders. Or if you are on a hard pack surface with stronger winds. Below are 3 kites we would recommend. These kites are user friendly and they have great depower, and are very stable kites for people who are new to the sport. These kites typically have more low end power and are more forgiving than performance oriented snow kites. Most people who are looking for a great kite to go cruise through the snow and catch some air from time to time will never out grow these Do-All kites. They are a great investment for your quiver. 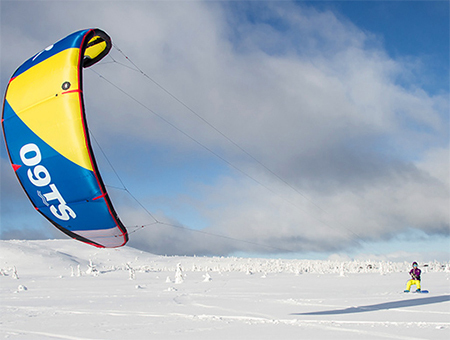 On a firm snow or hard packed snow surface with light powder, a 4m to 6m kite is a great size for lighter kiters and 5m to 8m kites are good sizes for heavier riders that are new to the sport. These kites will range from $600 to $1,500 up for the kite and control bar. You will also need a harness and leash. 3 Kites to look at; Flysurfer Viron, Flysurfer Peak4, HQ Apex. Consider the sizes between 4m to 8m. Inflatable kites can also be excellent snow-kites. The Ozone Uno trainer kite, or Eleveneight Rs are both great kites. 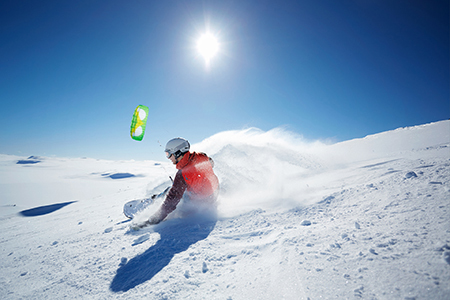 If you are considering learning both kiteboarding and snow-kiting an inflatable kite can be a great choice. 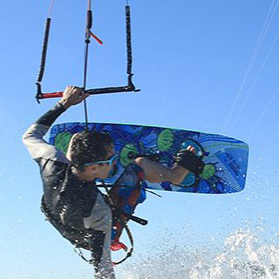 With Inflatable kites the same kite can be used for both sports; this allows you to build a quiver that will maximize your wind range for both kiteboarding and snowkiting. Inflateble kites will range from $900 on up for the kite. The control bar is often sold separate $350 on up. Then there is the harness ranging from $170 to $250 (for either a seat harness or waist harness). Total investment $1,350 and up. Join Our Mailing ListWhether you're a beginner or experienced kiter, Kitemare.com has the kiting gear to help fuel your progression. Thx for the voicemail and info. You guys are one in a million! I can't get over how thorough and helpful you've been. You're definitely a big asset to the sport and deserve success! Not sure exactly what, but there is something special about you :-) God Bless and thanks for the encouragement and help. I REALLY appreciate your quick and informative response. I can't tell how much better I feel just knowing there is someone out there who is willing to offer help. It was a privilege to talk with you today. Your approach to business is certainly refreshing. I look forward to receiving the kite and advancing my skills. Thanks for the guidance and incredible customer service. Thanks so much! Wish all companies were as helpful as this one. Keep being awesome. "Learn Fast, Kite Safe, Get Amped, Go Huge, and Share the Stoke!"